My style can best be described as "classic-elegant." I strive for uncomplicated pieces, balancing out unique beads with simpler ones, often making the more striking beads a focal piece. Some of my pieces have been inspired by '80s rock songs, such as"Fire and Ice" by Pat Benetar. Others, such as "Bruised," came from a concept of 'black and blue.' 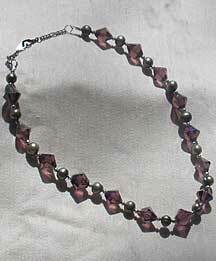 Other pieces simply arise from arranging the beads. I prefer glass, ceramic and stone, but I normally look for unique beads, such as the satin covered bead necklaces often found in second-hand stores (the beads look like miniature Christmas ornaments). I originally was arranging black acrylic and blue glass beads, and it came to me that 'black and blue' often referred to bruises. Once I decided on calling it "bruised", I realized that my beads didn't fit, so I swapped them out for the ones you see in the picture. Since the potato pearls and the glass bicones show the colors of a typical bruise when they move in the light. I fell into this last Christmas trying to turn a polished stone into a pendant as a present for my mother. I ended up buying so many and more tools and beads attempting to make her a suitable gift that I decided to continue. No one, but after I started designing my own pieces everyone who saw them encouraged me to showcase my work, and the bug stuck. My respective skill level varies, but I have sketched, knitted, sewn, embroidered, sculpted, hooked and braided rugs, amongst other things. Via an ad in a beading magazine (I forgot which one). Reading, about anything that catches my fancy, whether it be about craft, a lost or nearly lost trade (blacksmithing), philosophy, or technology; I want to learn it all. I love beading, and I would probably bead all day and night if I didn't have a house to maintain. I would like to make it my career, but right now I have to get up and running. I intend to sell wholesale to various boutiques throughout the city, using a web page to advertise. I have yet to enter a contest since most of my stock is bought locally, whether it be new beads or second-hand ones, making my work ineligible for your contests. I haven't done this, but I intend to look into it since you mention it.